Furniture storage is an art that requires a team of experts who understand how each item of furniture should be dismantled and protected to prevent damage when loaded into containers for long periods of storage. Our team of experts design a storage process to ensure each item is sufficiently protected, inventoried and loaded into containers at your home. Using our online portal, you can manage your storage account with ease and arrange for items to be delivered ad-hoc or in full, to meet your needs. Johnsons make storage simple and cost effective for students who want a quick and hassle free solution. Let us deliver your move pack that includes boxes and tape, collect them when you have packed, store them for as long as you like and then deliver them to anywhere in the UK when you are ready. We can answer any of your questions via our friendly customer help team using our Online Chat facility or by contacting your local branch. We offer next day delivery & collections (24hour) and part-load service to help reduce the delivery and collection costs. Move packs that include packing boxes and tape can be delivered in advance to help you pack, or alternatively we can do the packing for you. Our wide network of partners means we can arrange short or long-term storage in almost every major City across the globe. Our dedicated team will ensure that all of your items are individually inventoried and tracked from the collection in the UK to the destination storage warehouse. The whole service is planned and managed by a Johnsons Project Manager who will ensure your items are safety moved and stored in accordance with the agreed move plan. We offer piece of mind that your items are in safe hands, no matter what Country they are being stored in. 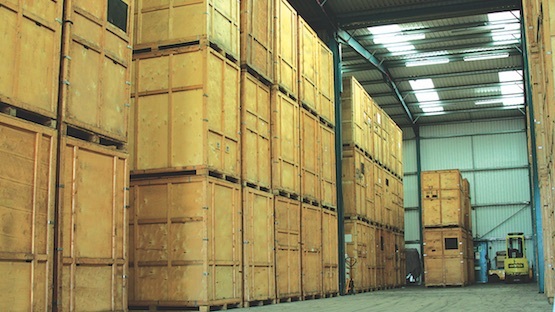 If you're looking to store your furniture or other items for any length of time, our completely secure, CCTV monitored container warehouses will ensure that all of your belongings are kept dry, clean and secure for as long as you need. Contact us on 0808 124 0014 for a free, no obligation quotation or visit our contact page to find your nearest depot.